What happened and why was Caty willed out? Apparently she was part of a suit against her father’s estate eventually settled in the North Carolina Supreme Court. At question was the rights of her deceased brother’s son Noah: https://casetext.com/case/osborne-v-widenhouse There are no known records linking to the unborn Osborne child and we know Christopher and Catherine eventually removed to Dallas Alabama. In Stanly County, next door to Cabarrus, there lived a man named Moses Osborne. His ancestry has long been unknown though his recorded birth in 1785 makes him the suspect child.. Christopher Osborne Sr was likely a mover amongst the Baptists and what better name would he seek for his unborn son! It’s my belief that a misfiled deed matched to lands of early settlers in the area around Love’s Chapel UMC has shed new light on the matter. In 1804 and 1806, Hillakiah Weatherford conveyed two adjoining tracts of land to William Morrison of Mecklenburg. 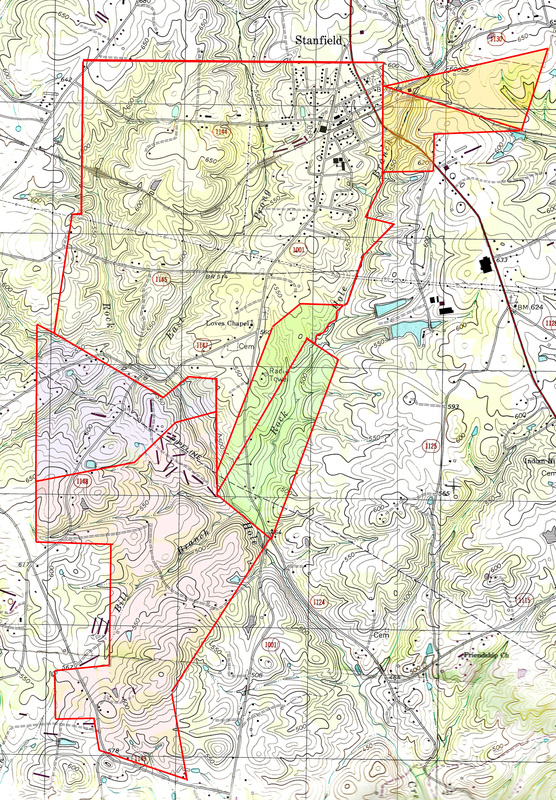 Recorded on book and pages 5-129 & 30, Cabarrus County, the land was located not in Cabarrus, but in then Montgomery County on the east prong of Rockhole Creek (see two green tracts below). Reading through the deeds, one of the tracts adjoined the lands of “Christopher Osborne.” Also note that the purchaser William Morrison eventually ended up in the same county in Alabama as young Christopher Osborne. Dated 1 Sep 1834, Thomas Craton conveyed a 684 acre tract of land (see large yellow tract below) to my ancestor, Jonah Love. Also situated on Rockhole Creek, Jonah and wife Mary later donated land for Love’s Chapel Methodist Episcopal Church in 1849. Note that Jonah’s big tract abutted the lands originally purchased by Hillikiah Weatherford. On 5 Jun 1838, Michael and Sally M (Pope) Garmon sold a small tract (14-42 Montgomery NC) to John Little. The tract shown below in blue nests nicely with the southern end of Jonah’s larger holding just below the church cemetery. The land also joined the Whortleberry pond and “lands of Moses Osborne). There are many land records for Moses Osborne though one in particular links well with the above. Dated 17 Feb 1853, Stanly County Sheriff Marvel Kirk sold a large tract (3-287, Stanly NC) to Andrew Honeycutt. Moses Osborne lost the land through court action. 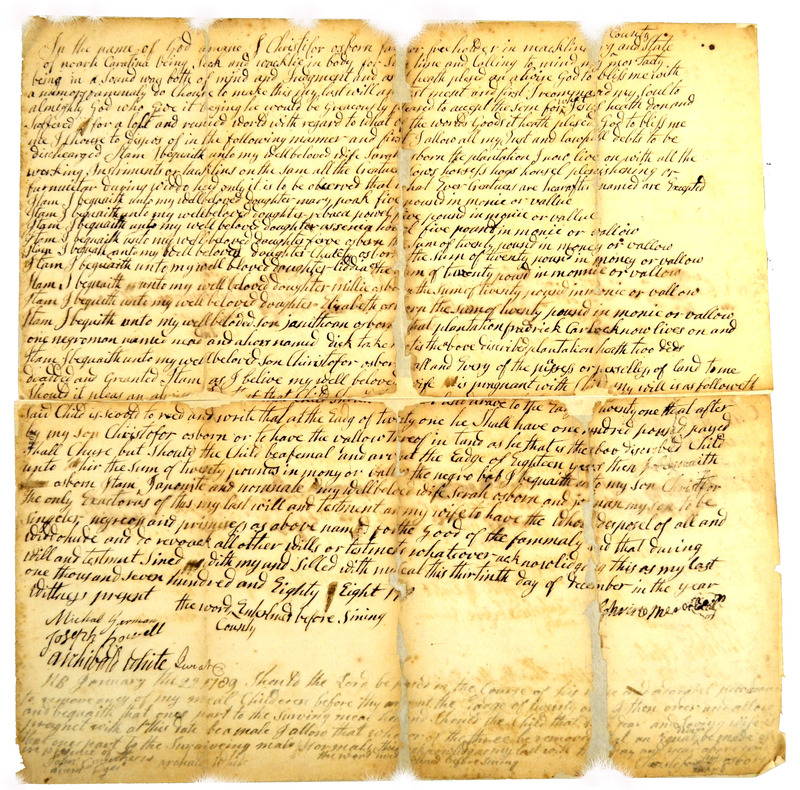 Note that in the 1804 transaction from Hillikiah Weatherford to William Morrison, the deed points to lands then owned by Christopher Osborne that were eventually owned and sold due to a case arising against Moses Osborne. This could be coincidental though there’s very little likelihood that it’s so. This is a rare find and in adding to the story, note that Paul Furr owned lands to the north of Jonah Love. Paul and Levi Furr owned two land grants (2774 and 2775, Stanly NC) shaded orange to the right side of Jonah’s land. This entry was posted in Love, Uncategorized on August 10, 2015 by geothos. I would love to talk with any descendants of Moses, particularly a direct line male–I have Y-DNA results for Christopher, Sr. and would LOVE to see such results for a Moses descendant.